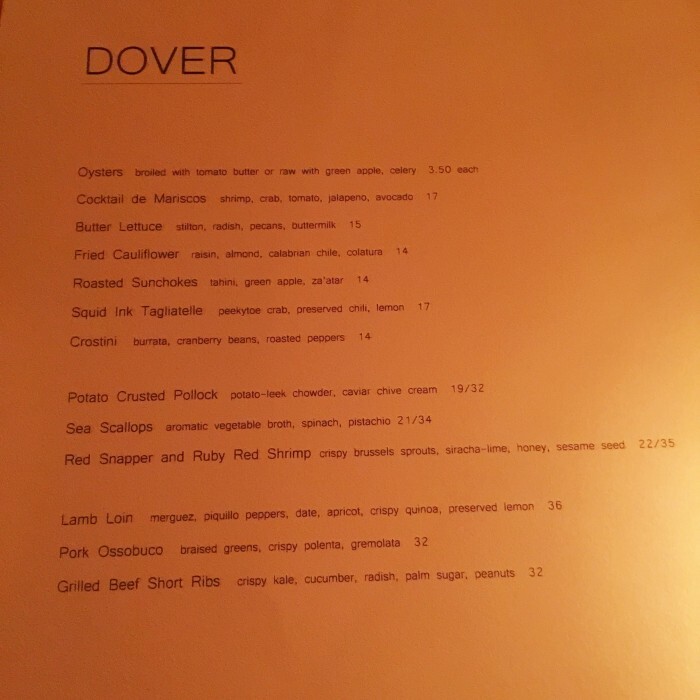 Dover popped up on Opentable, we checked out the menu, and we liked what we saw. So alas.. The menu was pretty small, and we liked the option of having the three middle fish dishes in either appetizer or entree portions. First, we decided cocktails: Jason did the Porch Swing and I did the Bartender’s Notebook, which was a Boulevardier on Wednesday night. Lately I’ve been pretty obsessed with Negronis (equal parts gin, Campari, and sweet vermouth); they’re bitter and sweet and delicious. And while I’ve had boulevardiers in the past, I had basically forgotten about their awesomeness until this meal. 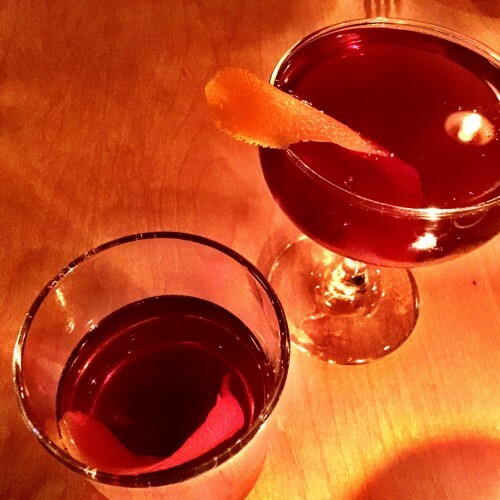 A boulevardier is the bourbon version of a negroni (just swap out the gin). It’s a slightly sweeter take on the original. Both cocktails were crafted perfectly, and the bartender stopped by our table himself to ensure that we were enjoying them. Nice touch. Next came the free bites. 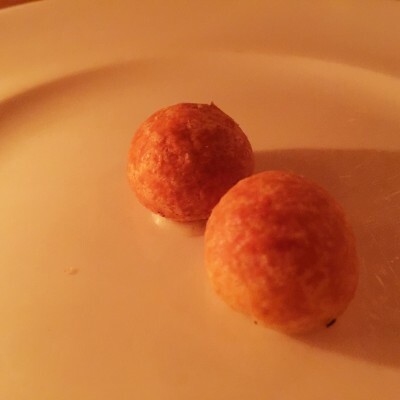 First were these tiny, tiny balls of wonderful cheesy flakiness; they had a French name that I can’t recall, and they were completely outstanding. 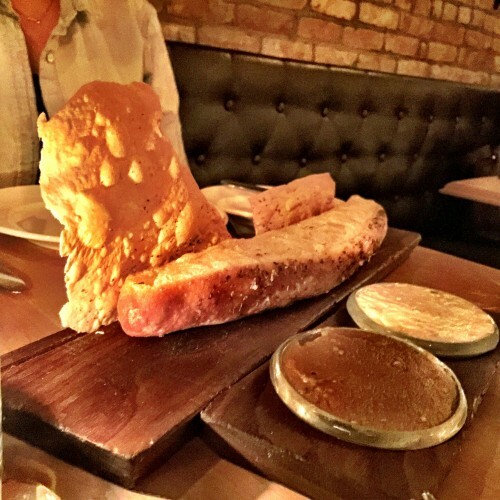 The sourdough bread was outstanding, too. 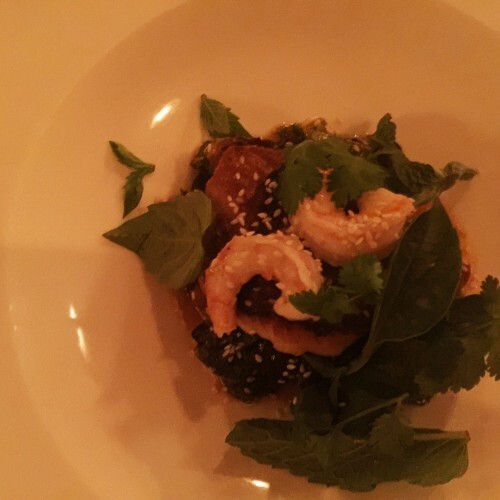 Especially that brown baba ghanoush – oddly smokey and salty and great. Next this taste of butternut squash soup came out: so buttery and sweet. There was a strange foam on top that seemed weird but tasted amazing. Finally we got to the stuff we actually ordered. For our meal we went with: two broiled oysters (one each, just to taste), crostini, roasted cauliflower, squid ink tagliatelle, and the appetizer portions of both the scallops and red snapper and shrimp, photographed in order below. So, in trying to pick some standouts it’s really difficult. I think I have to go with the tagliatelle as my absolute favorite but it has an unfair advantage being a pasta, and me being a pasta monster. The crab in the dish was quite generous and there was the perfect amount of spicy. It was creamy, which we weren’t expecting, and anything with toasted breadcrumbs on top is good with me. The scallops we adored as well, although we found the portion size (granted an appetizer portion) to be pretty small. There were five tiny bites of scallops on a bed of spinach. 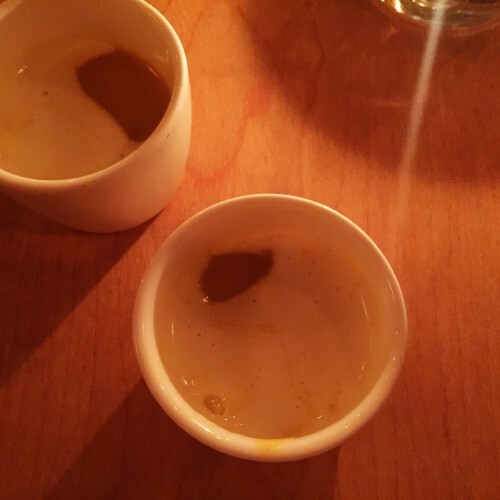 Although the bites were small, the crunch of the pistachio was a great texture balance, and the “aromatic vegetable broth” was a mouthful of mushroom, tomato, and buttery goodness. Jason and I drank the broth with a spoon once the actual bulk of the dish was gone. In fact, we found the scallops to be kind of in the backseat for this dish, and were actually way more excited by all the other components. 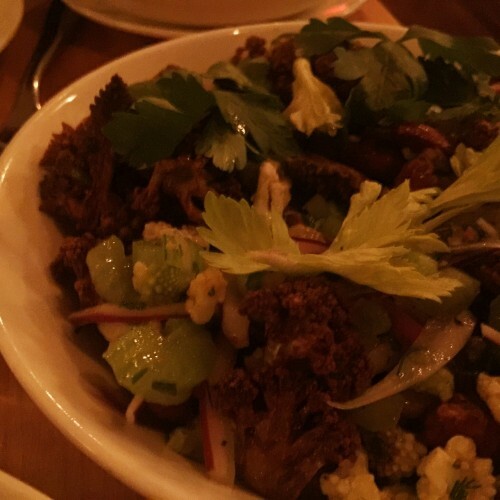 The cauliflower was another standout; I had low expectations but gave in to the argument that, “Maybe we should attempt to eat just one vegetable.” I was pleasantly surprised by the amount of flavor in the dish. 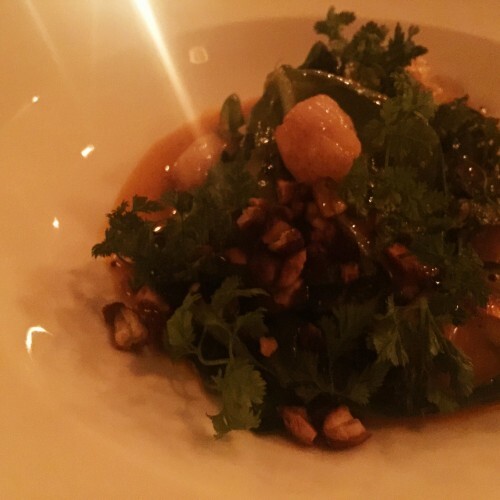 The roasted almonds were another great bit of texture, and the vinegar in the dish was somehow super strong without being the least bit overpowering. The occasional raisin throughout the dish added some sweetness, too. Mmm. 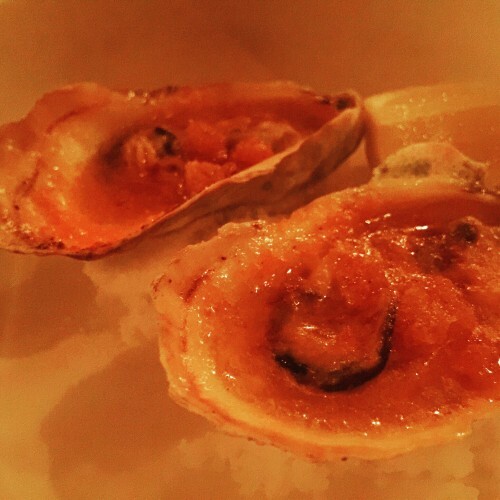 The broiled oysters are a total must have; there’s really no describing them except to say that one each was not enough. The crostini and snapper were both great dishes, but I think they fell to the bottom of my list of favorites simply because of preference. There’s no real criticisms of the dishes. I will say that the snapper was a little spicier than I anticipated, just for those of you who aren’t so into spice. It was a little more Asian inspired than we expected. 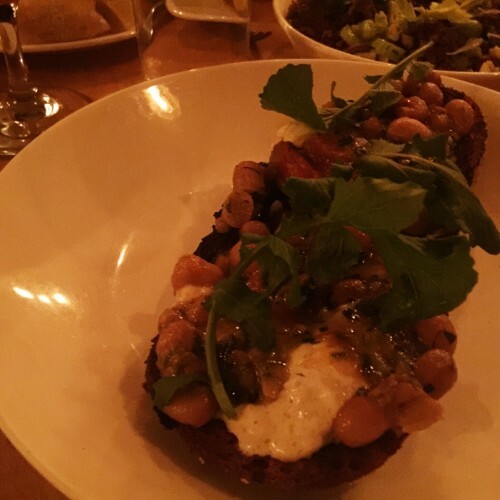 And the crostini, while great and garlicky simply didn’t live up to the other dishes’ amazingness. 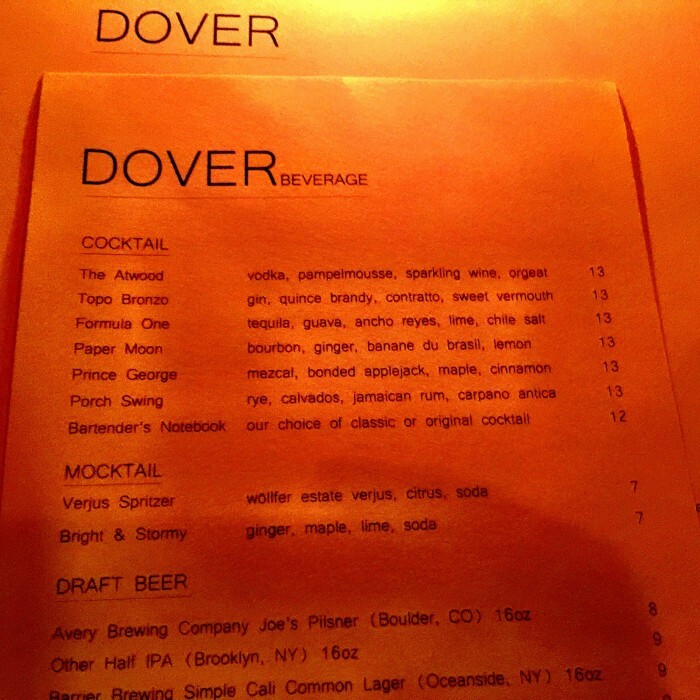 After dinner, I chose the salted caramel bourbon cocktail, and I did not like it. I actually hated it. Way too sweet and syrupy for my taste. In fact it tasted exactly like melted salted caramel, which is probably what they were aiming for, hence the name. I should have known better, and this cocktail was totally not for me. For dessert we did the olive oil cake, a perfect not too sweet last bite to end the meal. 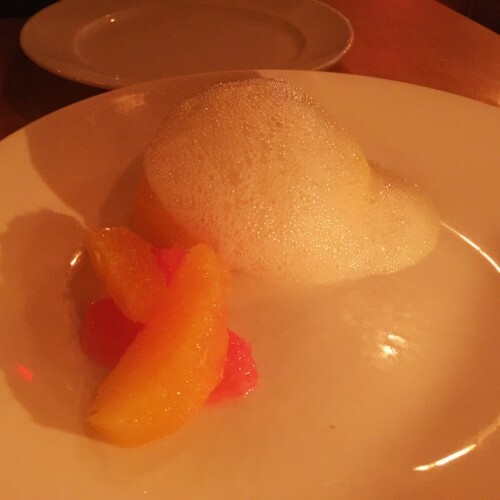 The grapefruit and lemony foam were great sour touches to go with the simple and delicious cake. We really enjoyed it. Our server was helpful and attentive. I asked a thousand questions (as usual) and she happily answered all of them. The hostess was friendly and warm, and the bartender seemed knowledgable and to really take pride in the fruits of his labor. We liked the ambiance of the place; it felt like a lighter and brighter version of many of the hipster spots in the neighborhood. I liked the way the lighting fixtures created pretty little sunbursts on the ceiling, and appreciated that not everything was dark and industrial. Four stars to Dover. Great job! 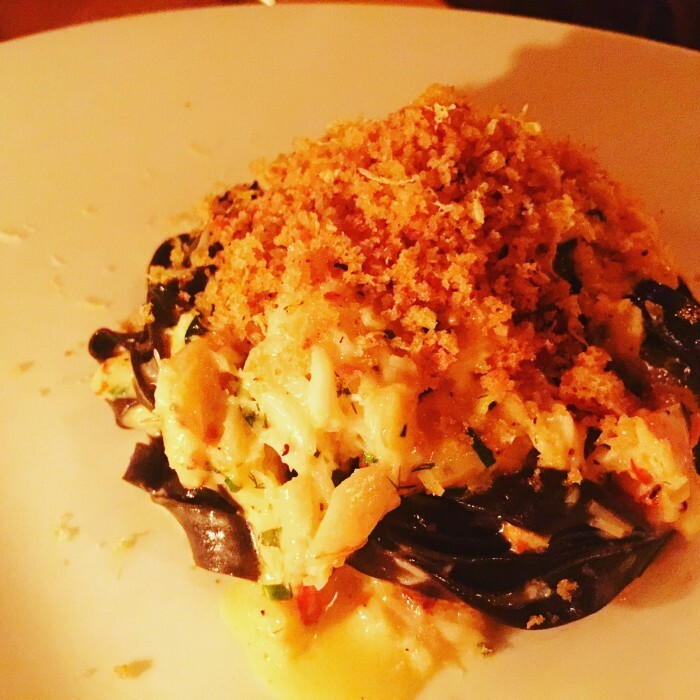 I’ll also add that it took every ounce of self control not to stop by Prime Meats for a hunk of sausage or bowl of herb and cheesey spaetzle… it’s just so closeby. But Dover satisfied us enough that we were able to resist the irresistible, so that says a lot.